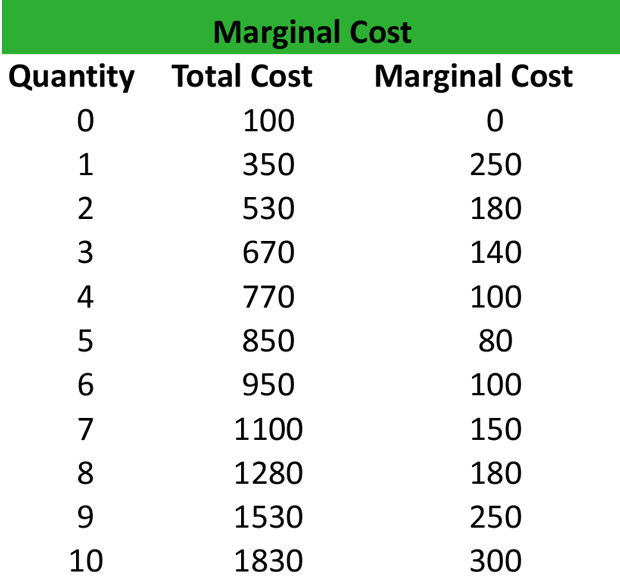 Home » Accounting Dictionary » What is a Marginal Cost? Definition: Marginal cost is the additional cost incurred for the production of an additional unit of output. The formula is calculated by dividing the change in the total cost by the change in the product output. What Does Marginal Cost Mean? What is the definition of marginal cost? MC indicates the rate at which the total cost of a product changes as the production increases by one unit. However, because fixed costs do not change based on the number of products produced, the marginal cost is influenced only by the variations in the variable costs. MC is particularly important in the business decision-making process. Management has to make decisions on where to best allocate resources in the production process. For instance, when the management needs to decide whether to increase production or not, they have to compare the marginal cost with the marginal revenue that will be realized by an additional unit of output. Is it worth it to the company to produce more goods on the whole? Manufacturing company X manufactures heating systems. The factor’s outdated existing equipment does not meet the firm’s manufacturing needs and can’t keep up with the production schedule. The firm has to purchase or rent additional equipment to maintain its production at the same levels. Thus, the accounting department needs to calculate the marginal cost of the heating systems that will be produced by the new equipment, including the cost of their acquisition. 1. The total cost increases as the quantity of the product increases because larger quantities of production factors are required. 2. The MC is reduced up to a certain level of production (Q=5), and then, it keeps on growing along with production. 3. The MC of producing an additional unit of heating systems at each level of production has to take into account a sudden increase in the raw materials. If the firm has to change its suppliers, the MC may increase due to longer distances and higher prices of raw materials. Define Marginal Cost: Marginal cost is the extra expense associated with producing one additional unit. 1 What Does Marginal Cost Mean?